Conflicts arise when communication breaks down. A prolonged strike or an ongoing dispute can have a link to improper communication. We see a decline of communication standards among Master’s level students who are either managers or administrators. This could be the tip of an iceberg where an overall decline in effective communication is taking place on multiple fronts. Today’s column is an attempt to shed light in this direction. We communicate from the womb to the tomb. It is part and parcel of human life. When communication breaks down, conflicts tend to occur. In fact, communication is the activity of conveying information through the exchange of thoughts, messages or information, as by speech, visuals, signals, writing or behaviour. Effective communication is crucial for the success of individuals as well as institutions. This is true even at the national level. Communication gaps pave the way for the construction of wrong perceptions, false opinions and incorrect attitudes. As scientists explain, communication is a complex two-way process, involving the encoding, translation and decoding of messages. Effective communication requires the communicator to translate their messages in a way that is specifically designed for their intended audience. I have seen managers thrive when they can clearly communicate. It is true for the private and public sector alike. That’s why we need to be brilliant with the basics with regard to communication. One key thing to remember is that the message that you intend to communicate is likely to be misunderstood. Therefore, in addition to carefully preparing and presenting your message, stay alert for any signs that your audience is misinterpreting it. Communication comes from the Latin root‘Communis’, meaning ‘to share’. It is to keep information in common. Therefore, communication, in brief, is information exchange. It even goes beyond. It is the activity of conveying information through the exchange of thoughts, messages or information, as by speech, visuals, signals, writing or behaviour. There are four key facets of communication. They are simply speaking, listening, reading and writing Effective verbal communication involves the use of both speech and writing to transmit a message. While oral communication is more effective in reaching a focused target audience as it involves interaction and additional non-verbal cues to augment the speech, written communication is necessary for reaching a large number of scattered recipients. Depending on the situation and the requirements, organisations use both spoken and written channels for communication. 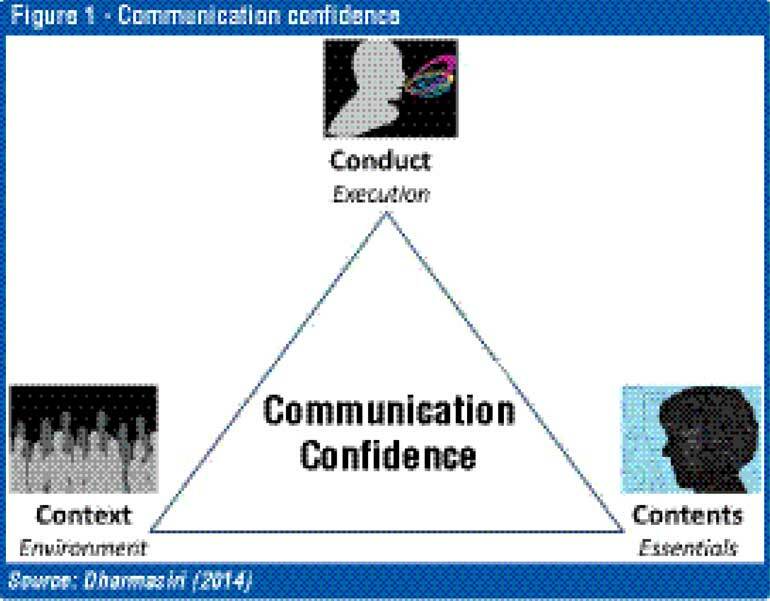 The way I see it, communication requires confidence with regard to three aspects. Figure 1 illustrates the details. ‘Context’ refers to the important areas such as knowing the audience, desired response and the clarity on objectives. It is mastering the environment in which the communication will take place. It is sad to see some powerful and influential individuals make statements without any regard to the context that might result in conflicts and clashes. ‘Contents’should have theright quality and quantity. It should be well structured with the proper sequence. The essence is the impact it makes and the importance it contains. It is about the essentials the message should contain. It should not just be “verbal diarrhea”. ‘Conduct’ is all about delivery. One important aspect is to be simple and specific. You’ve got to rehearse and then release. That requires a high degree of confidence.There is an old English saying that goes,“If you fail to prepare, you prepare to fail.” This is very true for presentations. It is the execution of your thought process in ensuring that the desired message is conveyed. “They may forget what you said but they will never forget how you made them feel,” said Carl W. Buechner, a preacher and theologian. It highlights the power of conduct. It is encouraging to see how leaders have mastered the above three Cs with regards to communication confidence. 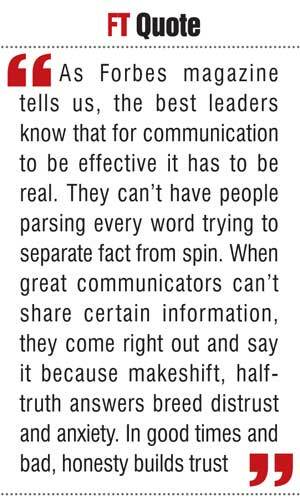 I have Western and Eastern examples.As Forbes magazine tells us, the best leaders know that for communication to be effective it has to be real. They can’t have people parsing every word trying to separate fact from spin. When great communicators can’t share certain information, they come right out and say it because makeshift, half-truth answers breed distrust and anxiety. In good times and bad, honesty builds trust. When Barack Obama created history by becoming the first African-American President of the US, observers commented highly on his communication skills. In fact, much has been written by people such as Richard Greene, a communication consultant, on the ‘communication secrets’ of Barack Obama. For me the secrets are not really secrets. They highlight the need to be brilliant with the basics. The first one is on voice, tone and body language. Obama had it down so professionally. The second secret is very relevant for us Sri Lankans. Obama had a lasered, compelling message. It was so powerful that it attracted the required audience. Even though heand his team ran intodifficulties in delivering results as time moved on, his method of giving a sharp, precise and inspirational message has not yet died down. Obama demonstrated an authentic passion in his speeches. Heprofessionally orchestrated his speeches in order to showeffectiveness in delivering the message. The words he used touched hearts and the secret has been the language of choice in strengthening humane aspects. He demonstrated authentic passion in his speeches. In therecent past, his tendency to become emotional at speeches was on therisebut no one found fault with him as the cause was something very authentic. According toForbes magazine, great communicators do not worry about sounding important, showing off their expertise or boosting their own egos. Instead, they think about what people need to hear and how they can deliver this message so that people will be able to hear it. This doesn’t mean that leaders tell people what they want to hear. Quite the opposite, they tell people what’s important for them to know, even if it’s bad news. We saw that in Obama. I did not expect this ruler from a tiny nation to be so inspiringuntil I watched his TED talk several times over. This relatively young leader is Tshering Tobgay, the Prime Minister of Bhutan. Tobgay is the leader of the People’s Democratic Party and has been the Prime Minister since 2013. It is amazing to see at a time when Bhutan is being overlooked by the international community, how this inspirational communicator made an impact by showcasing his country’s rich ‘carbon sinks’ such as forests. Being a country of about 750,000 people, Bhutan has set some impressive environmental benchmarks in joining some of the few countries in the world to have negative carbon emissions. One might argue that he had a powerful message to communicate. But that should not undermine the way he used his communication to attract needed attention from powerful nations. “A good speech should be like a woman’s skirt: long enough to cover the subject and short enough to create interest,” said Winston Churchill. A message is complete when it contains all the information that it should contain. Just what that information is of course will depend on the nature of the message. It reminds me of what Rudyard Kipling said a long timeago. In order to ensure a complete message is being communicated, the above ‘servants’ should berespectfully deployed. This should be in line with the popularly known seven Cs, namely being correct, courteous, considerate, complete, concise, coherent and clear. “I didn’t have time to write a short letter, so I wrote a long one instead,” Mark Twain once stated. Conciseness does not necessarily mean brevity, but being effective with the optimum useof words. I see a huge challenge for us here. Some of us enjoy elaborating with eloquence. Is it what the recipients really require?A concise message achieves its purpose without sacrificing clarity, completeness, courtesy and consideration. A good communicator simply eliminates unnecessary words and avoids monotonous continuity. “In the land of Gibberish, the man who makes sense, the man who speaks clearly, clearly speaks nonsense,” said Jarod Kintz, in his work, ‘This Book Has No Title’. I see a considerable relevance of this to Sri Lankans. Are we clear enough? Effective professional messages should be clear, readable and understandable. Sri Lankan leaders, administrators and managers alike need to deal with their stakeholders in communicating with confidence. Clarity over chaos is what committed leaders should consistently display. The power and potential of communication should never be neglected in reaching the community. Mother Lanka will prosper when its children continue to enhance their communication competencies. (Prof. Ajantha Dharmasiri can be reached through director@pim.sjp.ac.lk, president@ipmlk.org, ajantha@ou.edu or www.ajanthadharmasiri.info).